Artists Reflect on the Death Penalty. The death penalty has come under intense criticism of late. innocent people have been released from death row after years of wrongful incarceration. other innocents, such as ruben cantu in Texas, may have been wrongfully executed. Calls have been made to stop all executions and investigate the system or to abolish it once and for all. We organized this international, all-media, juried art show to foster the creation of new artwork on the death penalty, to celebrate artwork that may already have been created and to encourage and enhance civic engagement and dialogue about the death penalty. Democracy is animated when an informed public is engaged in the issues of the day. We hope this art show will reach new and diverse participants and audiences and will stimulate public dialogue about this contemporary social issue and inspire action to make change. Art is a wonderful medium for the transformation and awareness of the world. 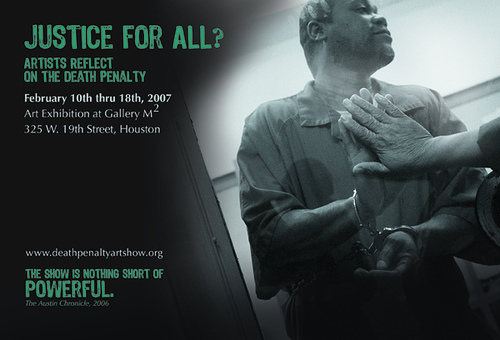 The death penalty art show was exhibited in Houston at Gallery M Squared from February 10 - 18, 2007 with an opening night reception at 7 PM on the 10th. The gallery is located at 339 West 19th Street in Houston (Map). There was a gallery talk Friday, Feb 16, at 7 PM with Margo Handwerker,Curatorial Assistant at the Museum of Fine Arts, Houston and instructor at The Glassell School of Art. The Austin Chronicle says "the show is nothing short of powerful." "Best in Show" ($500) went to Isabelle Heitzmann of Paris, France for "Lethal Injection (Barbie Jail Fun Series)", mixed media, 28x30x61 cm. artist's audio statement. Second place ($250) went to Annie Feldmeier Adams of Chicago for "Last Supper Trading Cards", cardstock and ink, 3.25" x 4.25", set of 52 cards. artist's audio statement. Third place ($175) was Jason Archer of Austin for "War Tribunal", giclee print, 24 x 16 in. artist's audio statement. Two merit awards of $50 each went to Mark Jenkinson of New York City for "Ricky Langley", digital c print, 30 x 40 inches. artist's audio statement. and Thomas Buchner of Germany for his series "World Wide Patent fig. 1, 2, 3"; adhesive tape on printed drawing, 29,8 cm x 21 cm. artist's audio statement. The jury also gave an award for "Best Work by an Artist on Death Row" ($175), which went to Robert Perez, who is on Texas' death row, for his two pencil drawings, "Texas Executioner", 22x14 and "Yellow Rose for Friendship", 14x12 in. The "Viewers Choice Award" ($100), which was selected by a vote of the opening night reception attendees, went to Ben Woitena of Houston for his work "Dead Man Walking" of painted steel, masonite, plexiglass, photo-montage & xerox copies, 39-38"h x 27"w x 3-1/4"d. artist's audio statement. List of artists whose work will be in the exhibition at Gallery M2 in Houston Feb 10-18, 2007. Online gallery of jury selections. We are excited to announce that we are using an innovative system called "Guide by Cell" for this exhibition. Visitors to the gallery will be able to call a number using their cell phones, punch in a number found next to each artwork and listen to an audio recording of the artist speaking about that artwork. The service is free, except for the use of minutes on the cell phones. The audio recordings are also posted as links on this website. We welcome submissions from artists who engage the issue from all sides. 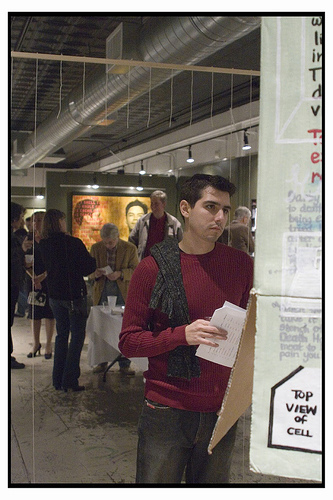 The death penalty art show is sponsored by and copyright © 2006 Texas Moratorium Network.